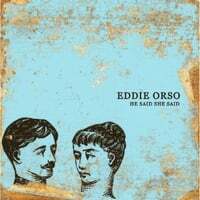 Eddie Orso-He Said/She Said. Eddie Orso is a Toronto singer/songwriter who's recorded several songs over the last few years and had been putting them out one-by-one on Bandcamp. He's collected six of them here to make an up EP of highly melodic heartland rock in vein of Tom Petty, Rich McCulley and compatriots Blue Rodeo. "Moving Straight" epitomizes this sound - ringing guitars, a rootsy sound and a swelling chorus. The frenetic "Mary Lou (Would You Let Me Down)" recalls the Bodeans, and "Be All Mine Tonight" wouldn't be out of place on a Gary Louris-led Jayhawks album. My favorite track here is "Counting on You", with its bright pop chorus that's a real earworm. Definitely a contender for the year-end EP list. 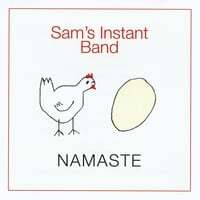 Sam's Instant Band-Namaste. Sam Baylor first caught my ear in 2006 with Life on Trouble Street, his first solo album after teaming up with Will Kimbrough in Will & The Bushmen, an excellent collection of roots-pop that was a capped by a cover of the Eddy Grant (later The Clash) classic "Police on My Back". He's back today with the amusingly-titled Sam's Instant Band (and a cover that poses the eternal question of the chicken-and-the-egg), and Namaste is a 7-track EP/mini-LP that picks up where Life on Trouble Street left off. Opener "Train at the Station" has a hint of jangle and a feel and melody that recall Bill Lloyd; "Day That We Die" brings Wilbury-era George Harrison to mind, as does the gentle "Walking in the Sun". The lovely, swelling ballad "Waiting" closes things out in nice fashion. It's good to have you back, Sam.